I’ll be at SPX this weekend! I’m at table F8-F9 with Kel, Shabet, and Magnolia! Come by and see me! It will be my very first east coast convention! I’ll have a collection of my short stories for sale! Look! They’re neat! So come on by! Also, my Kickstarter ends on Saturday! Go get it! oh my god Ike’s face in the last panel!!! *All* of Ike’s expressions are great on this page. I totally didn’t expect it to actually work either. We go throughout the entire comic expecting the unexpected and then the expected comes along leaving us surprised that the unexpected never came! You are a very clever storyteller. Oh dear god. Honey + fur. Which brings us to an interesting question, if he uses his medallion, cleans up considerably easier and changes back, what happens? Meh, he would still need to get it out of his hair. He’ll get what’s on his face and shoulders off easier, but the overall cleanup is still going to be pretty frustrating. Well, you also have to remember that the human appearance is an illusion. Even if he went full human it’d still be as hard to get out. I do recall the characters talking about the change as if it were an illusion, but that can’t be the whole story. If it were a mere illusion, their real bodies would continue to physically interact with their surroundings. It would be noticeable, and even if no one else realized something odd was going on, they themselves would necessarily be conscious of the fact that their bodies are not what they appear to be. I don’t see how it would be possible to reconcile that with Michelle having no idea she wasn’t human until reaching college. Not sure how it works out but… wasn’t there a similar thing going on in the anime Wolf’s Rain? They weren’t really humans, just illusions of humans – it has been a long time since I watched that show, I don’t remember how the wolf’s in human clothing interacted with everything. The medallion magic is an illusion, but it’s a tangible one. It’s sort of like the holo-deck on Star Trek: it’s not made of conventional matter, but it behaves as if it is. So when he’s human he still has fur, but not physically. I think that if the medallion’s magic can trick the laws of physics into thinking Alec is, like, one eighth his real size, it can make it easier to clean honey off the bits of him that are not hairy in human form. Something about a Kafka-reading Bugbear also being a Residents fan just feels right. It was nice of Lily to write “Hunny” there. Dear god, he’s gonna be PISSED XD. For the curious, the 1408 references a Stephen King short story, in which a reporter investigates a purportedly haunted hotel room. Seeing as it’s a King story, you might be able to imagine where things go. Totally digging the Residents’ poster on his bedroom door. And Lily wrote “Hunny” on the side of the bucket like one of Winnie-the-Pooh’s storage pots. I don’t know if I should groan or giggle at that. lol, LOVE the Winnie the Pooh reference!!! also, that hallway outside the apartment looks like the place Alec would love to live. Ok, Lily is going to take things too far. And her uppance will come. Characters, expressions, all great! Can’t wait for the next one! Priceless. Just priceless. Wonder how Alec’s going to react to this? …oh, wait, stickily. Ow… Wasn’t that several pounds of honey? Wouldn’t that not only be sticky, but really hurt? Not really. It was spread pretty evenly over his head – I’ve had 15 pound sacks of things fall on me, and it’s fine. It’s only when it’s one singular object that can bring the entire weight to a single point of contact. Honey badger lives in Room 1408 because… he don’t care! All I have to say is… vengeance shall be sweet! What I really love about these pages is that they display that here we are, sitting here wishing we were gryphons who could fly or bugbears who are awesome or any other number of things, even if you’re a spiffy mythic animal, you can still have that same wish. Grass is always greener, right? She might be a spiffy adorable goat-legged glaistig, but she is intensely into bugbears. Which she will never be. You never know. The talisman may have some interesting side effects. Deer lord that actually worked, Madam U, you’ve created a monster. Let the prank wars begin! Wait what? This is a straightforward story of what would happen if a prankster became immune to bugbear radar? I really wasn’t expecting that. This can only end in a revenge plot. Did Ike’s nose change from being pointy to huge and hooked between pages, or is that just his face going all manticorey? Regardless, I LOVE IT. Speaking of noses, I realize the charm worked for hiding her but… did neither of them smell the big bucket of honey??? To be fair.. the honey was in an enclosed room. It shouldn’t have been. The bucket has to be balanced on top of the door, which then has to be left ajar. I don’t think the door it fell from was the entryway into the department, but a different door in the apartment. Seeing the front door open would be suspicious. I think He had it coming, But I would like to watch him come up from behind as the underdog…although make the jerk work for it. Besides. As adorable as she is with her taste in pranks It should not take him to long to track her down. This is a question about something I just noticed from the previous page. Alec’s paws and claws are gigantic. How did he fit them into his pockets like that? My guess is that Alec has pretty fine control of his mid-form. When he feels like sticking his hands in his pockets, they’re human-sized enough to fit. There are lots of reasons some of us need pants that are bigger on the inside than the outside. It’s probably one of those huge tube shaped pockets that some hoodies have. His paws and claws probably fit okay in there, even if it’s a bit snugger than a human hands would be. I wouldn’t put it past Alec to find a way to give the metaphorical finger to Lily by turning her prank into something he enjoys. Would a large motherly bear work for you? 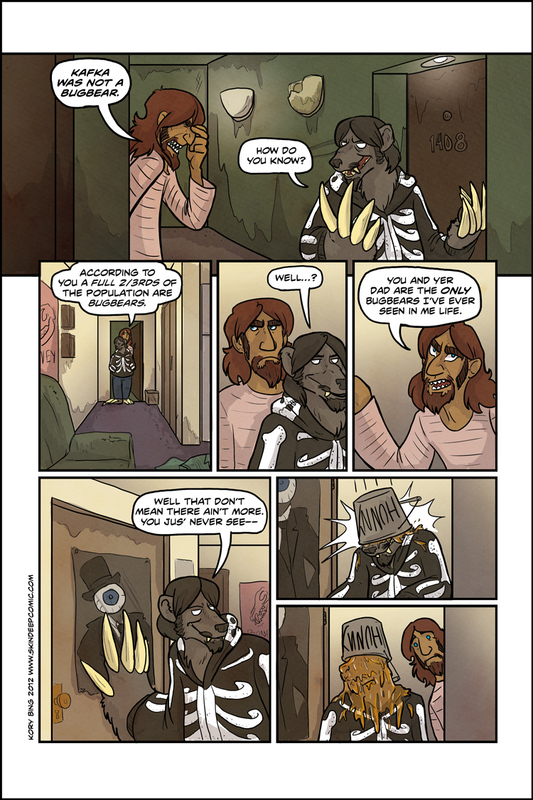 Because there are a couple of old pieces on Kory’s deviantArt of a Bugbear girl Alec dates at some point. She’s seen here ( http://korybing.deviantart.com/art/A-Halloween-Comic-68664777 ) with Alec telling a bad Halloween joke, and a portrait of her in midform is part of an old alphabet meme here ( http://korybing.deviantart.com/art/Skin-Deep-Alphabet-Meme-97788870 ) U is for Ursula. Of course, until she shows up in the comic, any details about her, including her existence really, is subject to change. Case in point, in that alphabet meme, J is for Jack. He is way paler in that meme than he has been since he showed up in the comic for the first time in Exchanges. Lots of other characters had tweaks to their names, appearances, and backstories between the first art posted of them and their introduction in the comic, too. Sadly, these links no longer work. Hoping they are somewhere else for viewing? Well he does have a part feline friend right there… Though I think he’d be even more nervous about getting licked over by a manticore. This is literally half a decade and some late, but Lovecraft being a self loathing Nokk would make sense thematically. Nokks are immortal, but go mad and violent at around their 50th birthday. What was one of Lovecrafts most famous books about? A town of half breed humans who are all cultists of a deep sea god thing, who are all hoping to transition into immortal fish monsters and live in the dark, ancient depths of the sea, in cities older than mankind. H.P. Lovecraft died about seven months before his 47th birthday… Would be a rather grim introduction to the story, huh? I saw Res. 1986, on the 13th anniv tour. Have a shirt. OF COURSE he lives in room 1408.